Sunday Morning: Holy Eucharist 8:00 A.M. and 10:30 A.M.
Wednesday Evening: Holy Eucharist and Anointing 5:30 P.M. The community is invited to join us for our Easter celebration on Sunday, April 21! Please join us for our services at 8:00 a.m. and 10:30 a.m. Our Easter Brunch and Egg Hunt will be at 9:15 a.m.
OUR HISTORYThe first congregation was organized by A. S. Thomas, a banker from Columbia, Tennessee. Early communicants were confirmed by the Rt. Rev. Charles T. Quintard. For a time, services were held in various homes and at the courthouse. The cornerstone of the church was laid on September 22, 1881 and that first Eucharist was celebrated in the unfinished Church of St. Mary Magdalene on May 4, 1884. 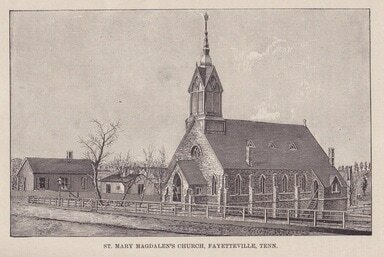 The minutes of the Guild of St. Mary Magdalene (the forerunner of the current Episcopal Church Women) state that the church was dedicated on St. Mary Magdalene's Day, July 22, 1884 and in 1890 the mission became a parish. The building was destroyed in 1952 as the result of a tornado. Following the tornado, the nine families with 33 active members, who were the church family of St. Mary Magdalene, rebuilt the church on the same spot but rotated 90 degrees to the south.A FAITHFUL CONGREGATION REBUILDS...Bishop Barth officiated at the laying of the cornerstone of the present church on June 7, 1953. The first parish hall was built in 1960; it was divided into Sunday School rooms in 1985 when a new parish hall was added. In 1982, St. Mary Magdalene celebrated its Centennial, and buried a time capsule to be opened in 2007. At the regular meeting of the Mission Council on December 11, 1991, the members voted unanimously to apply to the Diocese of Tennessee at the 169th Convention for parish status. In the calendar year 1991, the church became financially independent of the Diocese of Tennessee. In January 1992, it obtained parish status. CLERGYFrom the time of its founding until about 1920, the church was served by full-time resident clergy. From 1920 to 1955 it was served by seminarians and supply clergy from the University of the South at Sewanee. During these years without a priest, the church was forced to go from "parish status" (being entirely self-supporting) to "mission status" (depending on the diocese for financial support). The church did not have a resident priest again until 1955. IVY FROM CASTLEThe ivy which grew on the walls of the old church until it was destroyed was brought from Kenilworth Castle, the home of Sir Walter Scott, in England. "Rev. Hale," the second Rector at the church was an Englishman and on various trips back to England he brought articles to be used in the church. These items were slightly damaged in the tornado, but were restored and are still in use today. A huge brass eagle, whose out-spread wings held a large Bible, was purchased by the Rev.Hale and is still in good condition. Suspended from the exposed, aged, wooden rafters above, the chancel of the original church were seven brass lamps with red glass chimneys enclosing candles. The lamps represented the seven churches of Asia. They were demolished by the tornado and one was blown through the wall of the rectory next door. Even before the disastrous tornado of 1952, another tornado had damaged the church slightly in 1890, but it was evidently not very serious. (THIS PORTION OF HISTORY WAS TAKEN FROM THE REV. ROWLAND HALE'S PERSONAL NOTES ON THE ORIGIN AND HISTORY OF ST. MARY MAGDALENE CHURCH, OF WHICH HE WAS THE SECOND RECTOR. )The current altar has been present in the church since its inception. The altar is a memorial to the Rev. C.C. Parsons and the Rev. John M. Schwar who fell victims to the Yellow Fever in 1878. This memorial was the gift of the mother of the Rev. Rowland Hale, Rector. It is the work of Geisler & Co. of New York. It is of oak with carved panels, the center one showing the "Agnus Dei" (Latin) for "Lamb of God." The Rev. C.C. Parsons and the Rev. John M. Schwar are among the clergy remembered with Constance and her Companions as the Martyrs of Memphis on September 9th in the liturgical calendar. ​Click on the following images to open a new page.